‘LILYWHITE Lightning’ Eric Donovan is too long in the sport of boxing to look past his next opponent but at the same time, he knows the possibilities that a win over Stephen McAfee in the National Stadium might bring. The dream is to lift the title in Dublin and then defend it in Kildare. 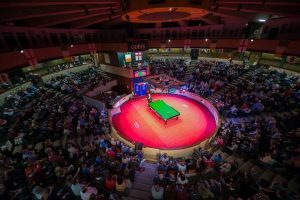 Donovan and his manager Leonard Gunning have trawled the length and breadth of Kildare to see if there would be a venue suitable to all their needs and one stands head and shoulders above the rest – Goffs. “I think it’s going to kick on from Saturday night and that I am going to have more big nights in the National Stadium, for bigger titles or maybe a homecoming in Kildare which I dream of. Goffs, or somewhere like that, I don’t care where it is but if I could bring a homecoming fight back to Kildare and get the Lilywhite army there that would be fantastic. “I have spoken to representatives of Goffs and they weren’t totally against me boxing there. They were telling me that there are a few kind of logistic things that have to be sorted out but nothing is impossible. With the right timeframe and organisation we could make it happen and make it work. It would be a dream come through for me but I honestly feel that at the rate we are going at that Goffs might be too small a venue so it would want to happen soon if it is going to happen,” said Donovan.